Use them to roll on to your chakra points and inhale the aroma. 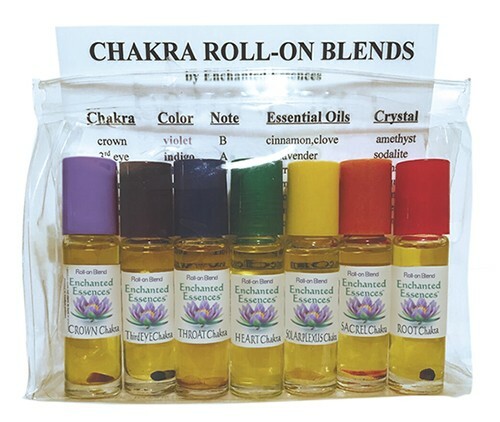 Contains 7 Roll-on Blends that contain Essential Oils as well as Gemstone Crystals which correlate to each of the Kundalini Chakras of the Energy Body. For example the "Root Chakra" blend contains Sandalwood, Patchouli, Rose Oils and a Garnet Crystal. Can be applied to the wrist for easy access to smell the Aroma. It comes with an Informational Card that shows the Corresponding Essential Oils, Crystals, and Chakras.